Pat started his buildup with an old AMT 1923 Ford Budweiser Delivery Truck kit body. 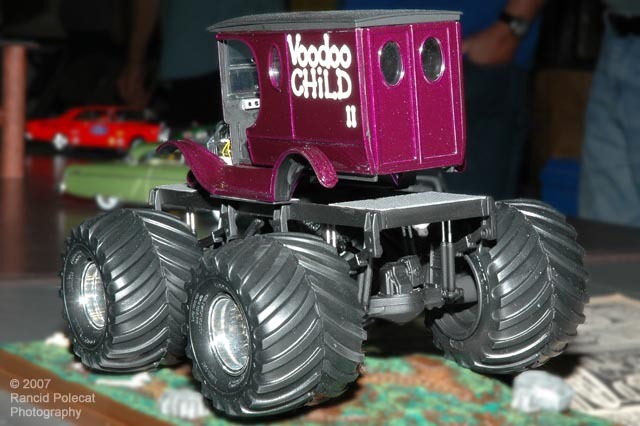 The C-cab rests on a modified AMT Destroyer monster truck frame and suspension. Pat had to create a new transfer case and added the diamond plate frame platforms fore and aft. Seats are AMT 1933 Willys units from the parts box. The lettering is dry-transfer lettering from a local craft store. Pat says that between all the frame/suspension work and mating the frame to the early Ford body, this project was a test-fitting nightmare. Paint is an uncommon Testors Boyd's Candy Grape Pearl.